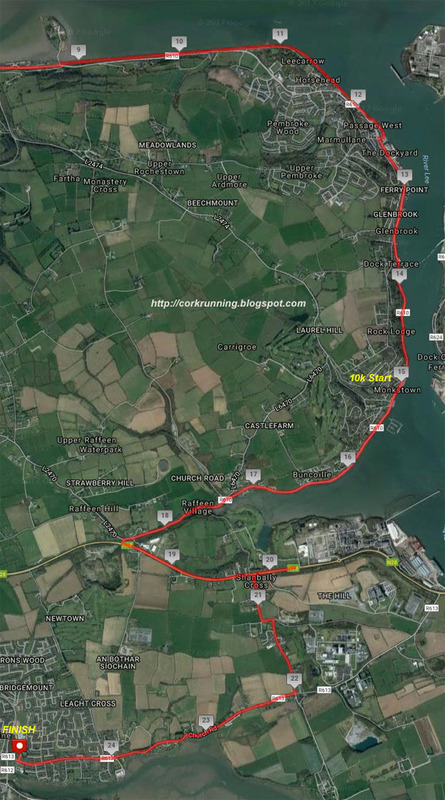 The run follows much of the route of the old railway line that ran from Cork to Crosshaven and closed in 1932. About 18 kms of the route is alongside the waters edge making it a nice run. The full course is pretty flat with probably five small hills at most. For the next 3 kms, you stay on this pathway until you re-join another pathway which is actually the old railway line itself. 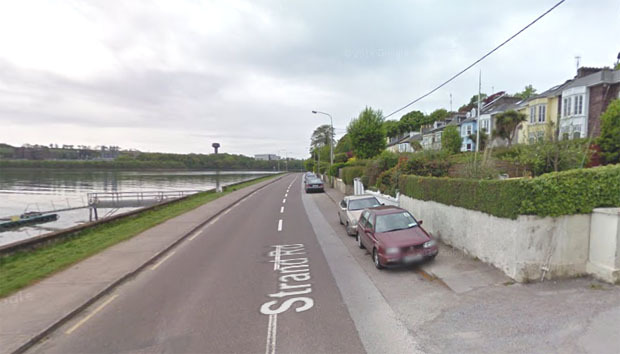 You then cross over the Douglas Estuary and pass the apartment complex at Harty's Quay. The limestone building on the left was a support for a large water tank which was used to supply the steam engine. 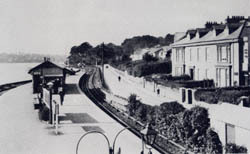 The station was located just behind. The course now continues through the town and there is a small hill just around the 13km mark. 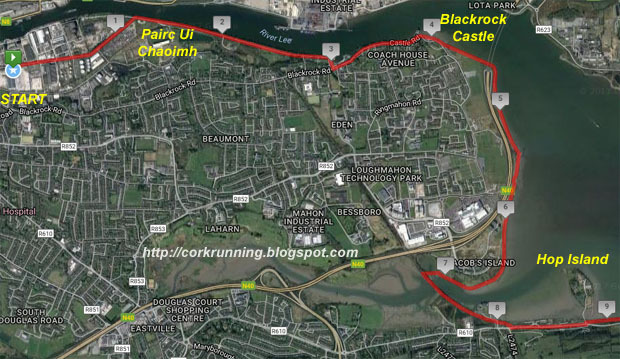 In fact, the course has been more or less dead flat since just before Blackrock Castle back near the 3km mark. Past the cross harbour ferry, then onto to Monkstown itself....roughly 15 kms. The car park in Monkstown is where the 10k will start. This used to be the old railway station and still includes some of the old infrastructure. The wall next to the footpath is part of the old platform while the small limestone building on the left was a support for a water tank. The course here continues to be dead flat and soon you pass the new marina in Monkstown. This is a really nice stretch with extensive views of the outer harbour. This is the one section of the course where traffic may become an issue so follow the race stewards instructions. The narrow section lasts for about one mile and includes one or two very small inclines. From here, you run alongside the main road as it rises up to Shanbally at about 19.9kms. At Shanbally, there is an out and back section which adds about 1km to the course. From here, you just follow the road to Carrigaline. This section has a number of small pulls but nothing too serious. The finish line is near the Community Centre in Carrigaline. Overall.......The 25 km race is mostly on a public walkway or footpaths until Monkstown. After this, there is more running on roads as you move away from the harbour. Generally, a flat enough course with only minor hills. 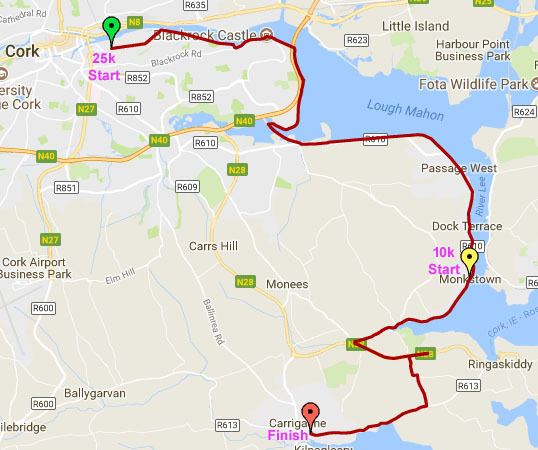 The most unique feature of the race is probably that you start in Cork City and end up in Carrigaline, something that most people wouldn't do as a run. In that respect, it's similar to the annual Cork to Cobh 15 mile race every year...another point to point event instead of the usual looped course.